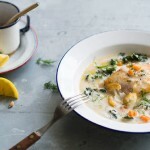 Pan-fried fish with avgolemono braised greens Recipe by Maria Benardis! In this Greek recipe, the avgolemono sauce adds tang (from the lemon) and silkiness (from the egg) to the braised vegetables, and marries perfectly with delicate white fish..
Heat 80 ml (⅓ cup) of olive oil in a large saucepan over medium-high heat. Add the leek and onion and cook for 2–3 minutes, until the leek begins to soften. Season to taste with salt and pepper. Add the carrot and fennel and cook, stirring, for 5 minutes, until carrot softens. Add the kale and cook for a further 2–3 minutes, until the kale begins to soften. Pour over enough stock so the vegetables are just covered. Adjust the heat to a gentle simmer, cover and cook for 5–7 minutes, until the vegetables are tender. Heat the remaining 60 ml (¼ cup) olive oil in a large saucepan over high heat. Season the fish with salt and pepper and cook for 2–3 minutes on each side until cooked through. Whisk the egg white in a bowl until white and frothy. Add the egg yolk, whisking until combined, then slowly whisk in the lemon juice. Take a ladleful of the hot braising liquid from the saucepan and whisk into the egg mixture. Pour the egg and lemon sauce back into the saucepan and cook for 1 minute, shaking the saucepan to mix through. Stir through the dill. Divide the vegetables and sauce between shallow bowls and top with fish. Serve immediately.